The tour group was made up of 15 people including myself. Everyone else was American and predominantly from southern states other than South Carolina. Our guide was a man named Stu who, like many people who lived and worked in Charleston, had moved there from up north. Stu was originally from New Jersey but had since given up work as a stock broker to divide his time between giving tours of Charleston’s most haunted places and writing fiction. The grave looked like an aircraft hangar made of bricks. It was surrounded by some of the oldest graves in Charleston, their headstones chipped, faded, and covered in lichen. We were encouraged to take photographs around the graveyard in an attempt to catch any orbs but with little success. Stu carried a tablet with him on which he kept evidence of a number of successful photographs from the various sites we visited. “This is the church that I attend. 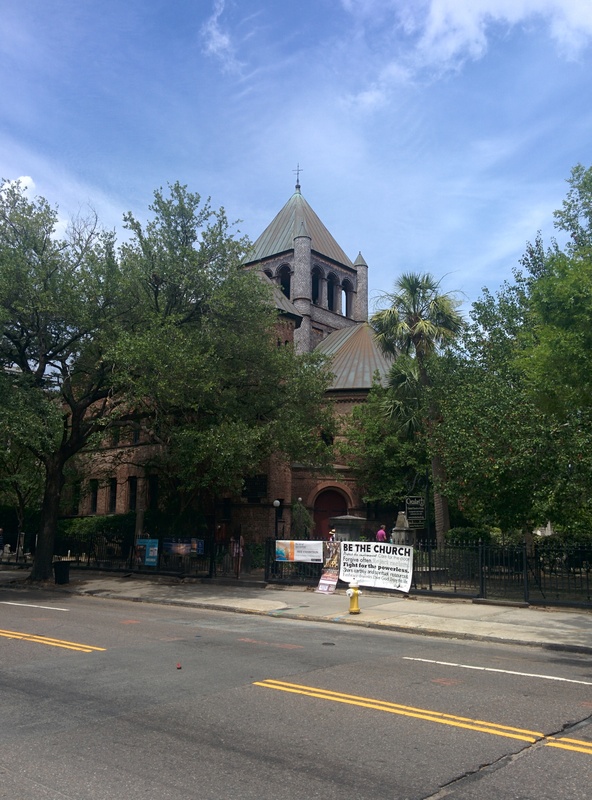 It’s one of the oldest in Charleston,” Stu had said as we ducked beneath low hanging branches. There was a rainbow flag on the iron railings outside proclaiming all were welcome. “So you believe in a higher power?” A woman asked. This seemed typical of what I had seen of the South. Where we had a newsagent, Starbucks, or pub on every other corner, the South had a church. The residential street on which I was staying had two churches less than 5 doors away from each other. Both churches looked as if they had started as houses but had mutated one feature at a time to look more fitting as a place of worship. Its congregation is one of the earliest established in the United States, dating back to 1681. The church in its current form was rebuilt in 1892 after being destroyed by fire. The parish house was built in 1806. We passed through more sites including a square which used to house the cities gallows. We were told the story of a young woman called Lavinia Fisher who was known to murder travelling salesmen by poisoning their tea. She and her husband were convicted of highway robbery and sentenced to hang. However, at that time there was a law in Charleston that prohibited the execution of married women; this was something that Lavinia pointed out to the judge.